Adding to IDW Publishing’s ever-growing partnership with Marvel, the publishers announced today at New York Comic Con they will be teaming up to bring the world’s most popular Super-Hero, The Amazing Spider-Man, to IDW’s Library of American Comics (LOAC) imprint. 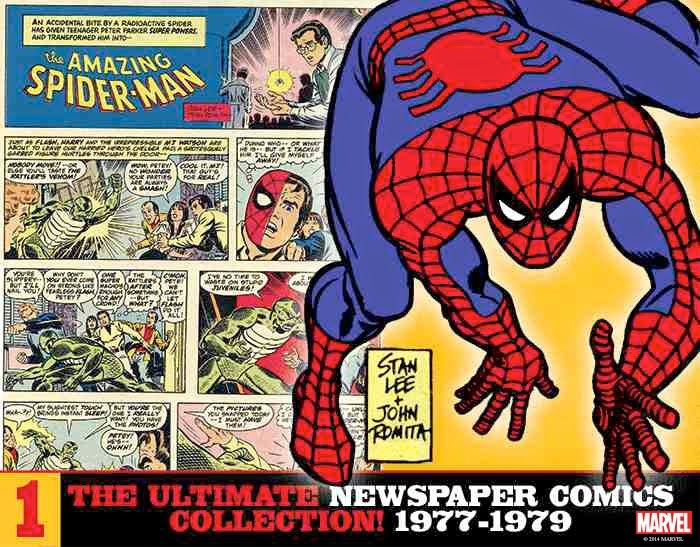 The wondrous wall-crawler’s long-running newspaper strip by Stan Lee, John Romita, and others will be collected in a series of deluxe new hardcover editions that are sure to leave Super Hero fans and comic-strip collectors equally delighted. Consistent with the other newspaper strip reprints in the Library of American Comics line, each volume in the Spider-Man series will include full-color Sunday pages. Launched in 1977, the Spider-Man newspaper strip begins with Peter Parker’s arachnid alter-ego facing off against the deadly menace of Doctor Doom! Classic Spidey villains, including Kraven the Hunter, Doctor Octopus, Mysterio, and the Kingpin, make appearances in pulse-pounding tales drawn by master Spider-artist John Romita Sr. and written by none other than Spider-Man co-creator Stan “The Man” Lee! As the series unfolds, the artistic torch was passed to Larry Lieber (Stan’s younger brother), Paul Ryan, Alex Saviuk, and legendary inker “Joltin’” Joe Sinnott. No matter the artistic interpretation on display, The Amazing Spider-Man comic strip features the kind of fast-paced action and genuine human emotion that has made Peter Parker a star in movies, theatre, TV, video games, and the comic books that started it all back in 1962 with Amazing Fantasy #15. LOAC’s Spider-Man series is designed by Dean Mullaney and edited by Bruce Canwell, both winners of multiple 2014 Eisner Awards for Genius, Illustrated: The Life and Art of Alex Toth. The Amazing Spider-Man, Volume 1 goes on sale in early 2015, so plan a visit to your favorite comics shop or bookseller so you can enjoy the special Lee/Romita storytelling magic and learn with Peter Parker once again that, “With great power comes great responsibility”.